Are you a crust or filling person? Pie eaters (I’ve found) fall into one of these two distinct categories. Those who tolerate the crust as a means for getting gorgeous amazing delicious filling into their mouths. 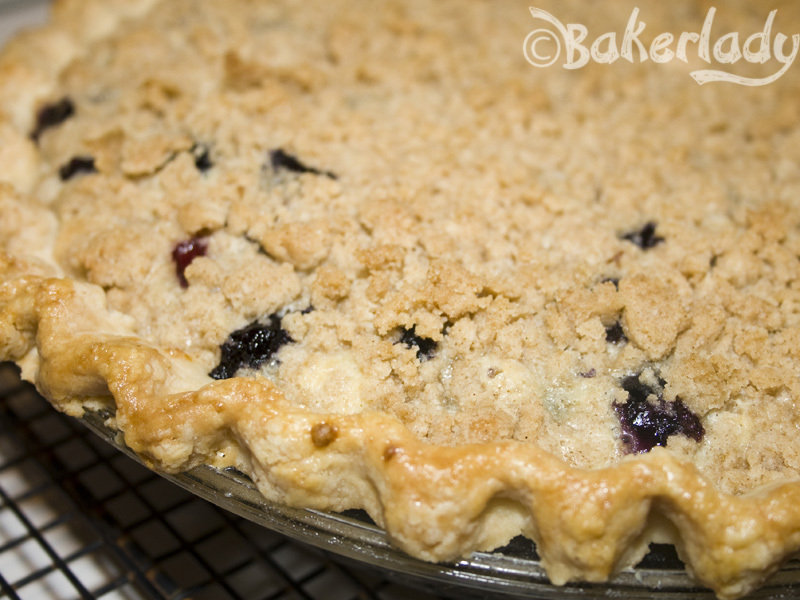 And those who believe a flaky light crust absolutely is the best thing about pie. 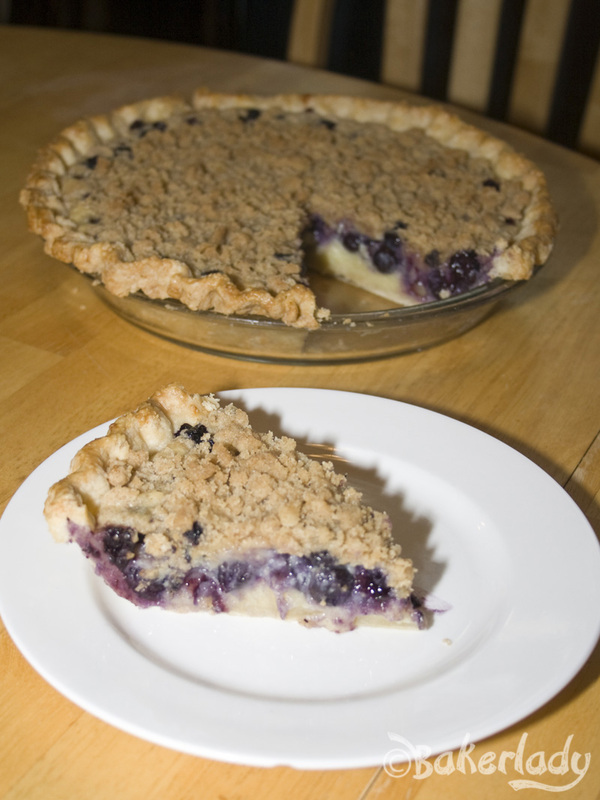 That the filling is plays second fiddle and is really only there because you can’t just eat pie crust on its own. The fact that you need something else to go with crust is one of the reasons I am a filling girl. You can totally gobble fruity (or custardy) filling with a spoon. It needs no other accoutrement to make it delicious. My husband is all about the crust. Personally I’ll take a crumble or a cobbler any day over pie. More filling, less crust. Thankfully this blueberries and cream pie gives us both a little something we love. And that makes everyone happy. On the bottom, a flaky buttery crust. 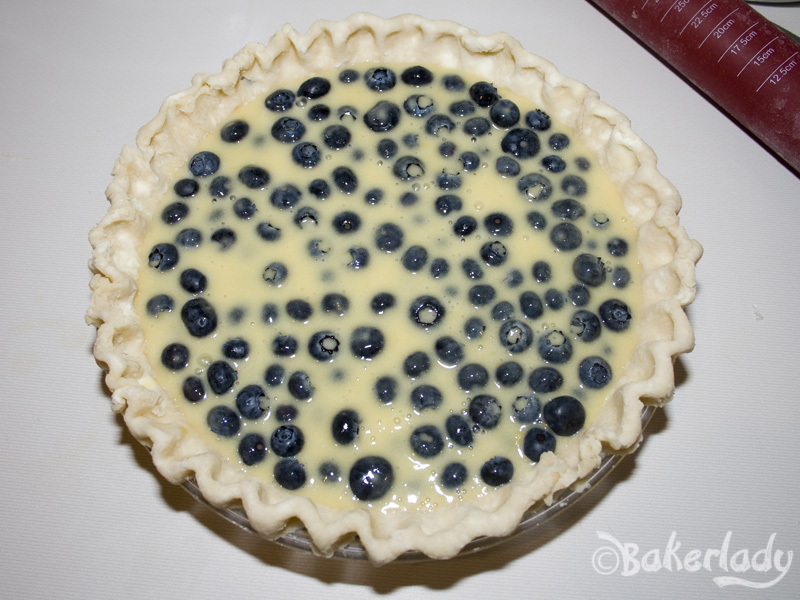 Filled with blueberries. You know what’s awesome about blueberries? No chopping, cutting seeds out, coring, or peeling. Give em’ a rinse and in they go. Perfect. Topped with an amazing creamy custard. The custard is just divine. Finished with a crumb streusel. Seriously delicious food here people. All those bright fresh berries swimming in sweet rich custard? Yeah. The crust is bomb too. But the filling…ooooooh the filling. 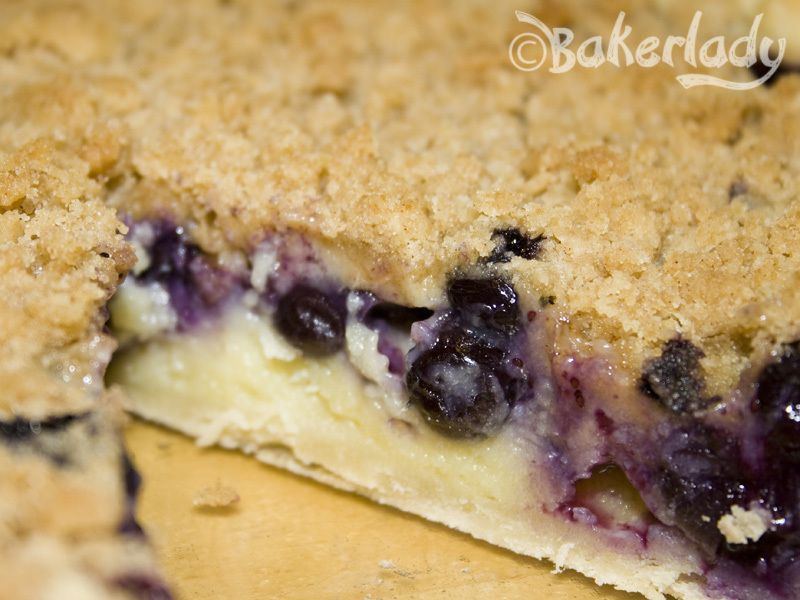 It’s the perfect blend of a cream pie and a succulent fruity cobbler. Glorious summer goodness. As a side note. When I served this up for dessert I discovered the mystery of genetics explained on my children’s plates. Madison ate her crust first and after a few bites of the filling declared she was full. Donovan devoured the fruity custard and left his crust untouched. When he proclaimed he was stuffed Madison lept at the opportunity to eat his abandoned crust. Go figure. Process flour, sugar, and salt in food processor until combined. Add chilled shortening and pulse until coarsely ground. Add chilled butter and pulse until mixture resembles coarse crumbs. Transfer to large bowl. Let chilled dough soften slightly at room temperature, about 10 minutes. Working on lightly floured work surface, roll dough into 12-inch circle. Transfer dough to pie plate. Trim, fold, and crimp edges. Cover lightly with plastic wrap and place in the freezer for 30 minutes. 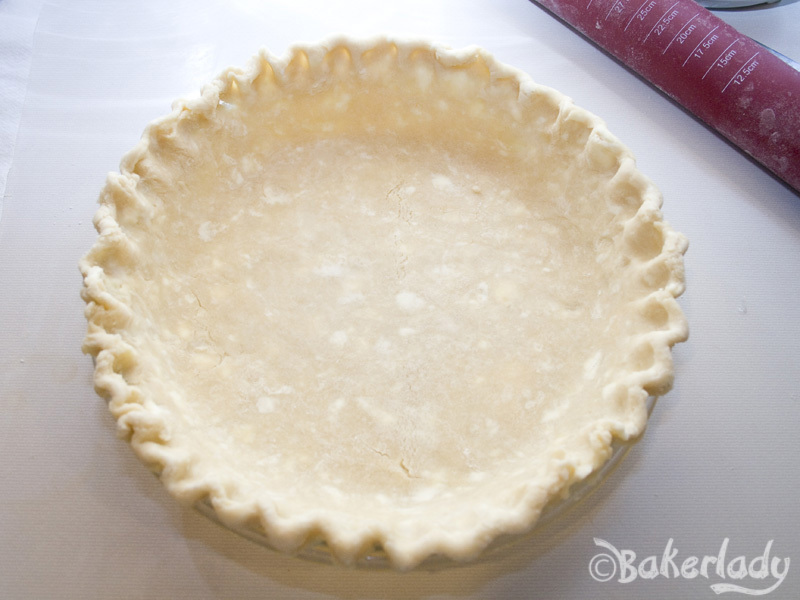 While crust is firming up, work on the filling. In a bowl of a stand mixer with the paddle attachment, mix together the sugar and flour. Add in the sour cream, eggs and vanilla extract and mix until combined. 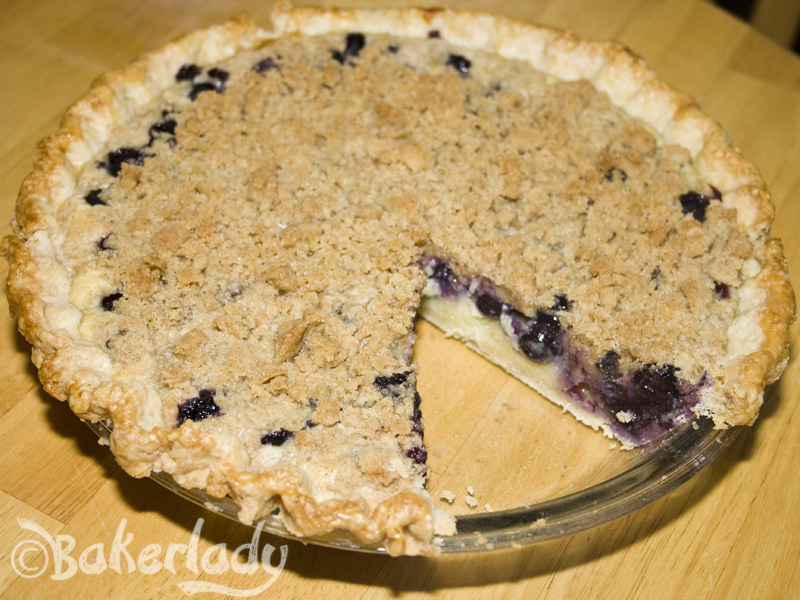 Take the pie out of the freezer and put the blueberries on the bottom of the crust. 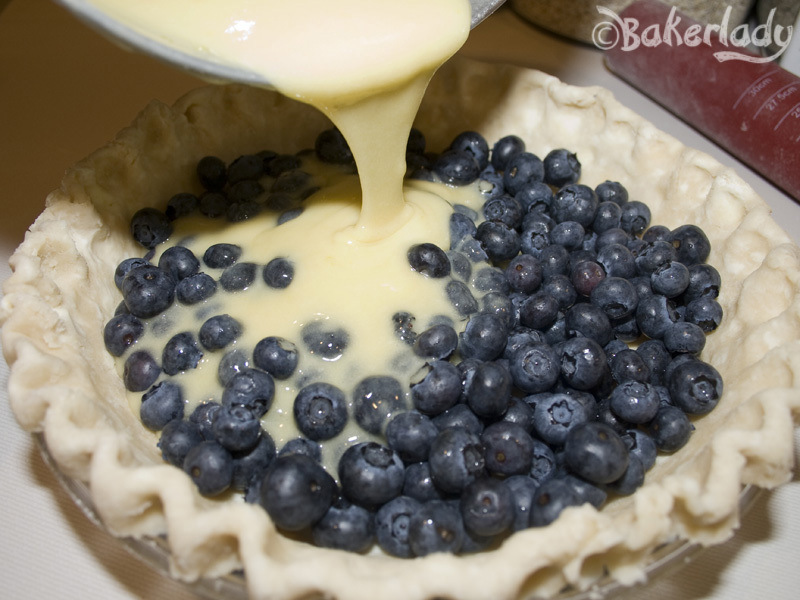 Pour the filling over the blueberries and spread it out. Now make the crumb topping. Mix together the sugar, brown sugar, ground cinnamon and ground nutmeg. Pour the melted unsalted butter into the bowl and mix everything together. Add in the flour and mix until the ingredients form a crumble topping. 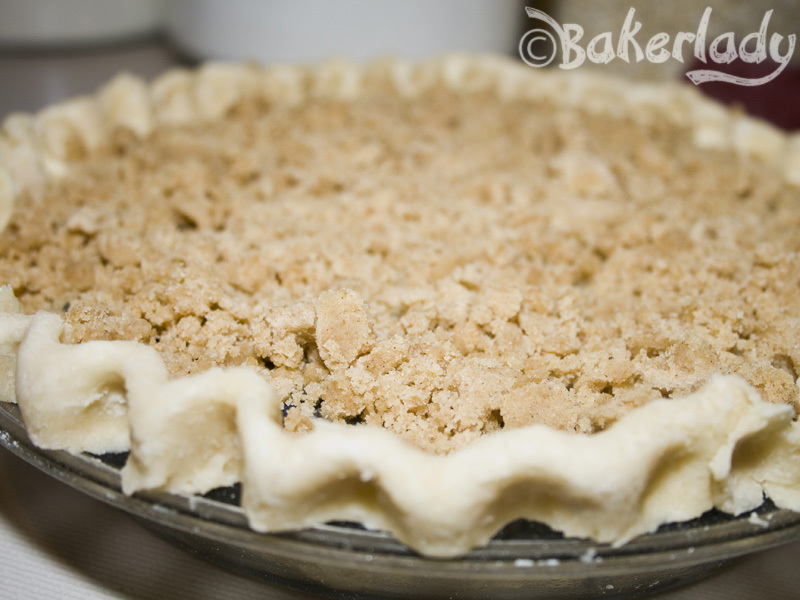 Crumble the crumb topping over the pie. Mix together 1 large egg and a Tablespoon of water and brush over the edge of the crust. Bake the pie at 350 degrees for 50-55 minutes. 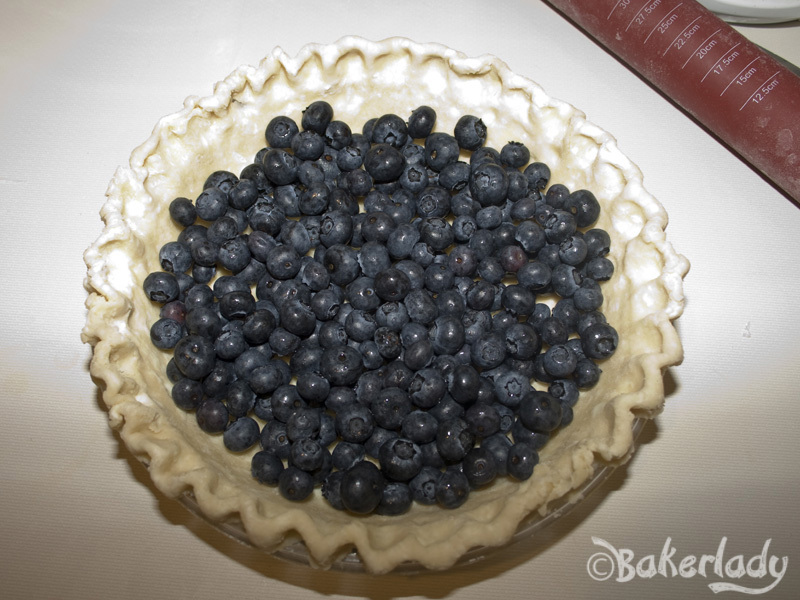 Let the pie cool before cutting into slices. Then enjoy! holy cow this looks amazing! Keep up the great work! Made this tonight. So yummy!!! So far I’ve made this pie three times and will make two tomorrow for a block party. I love how easy it is to make! You are a crazy pie maker! Well done you! 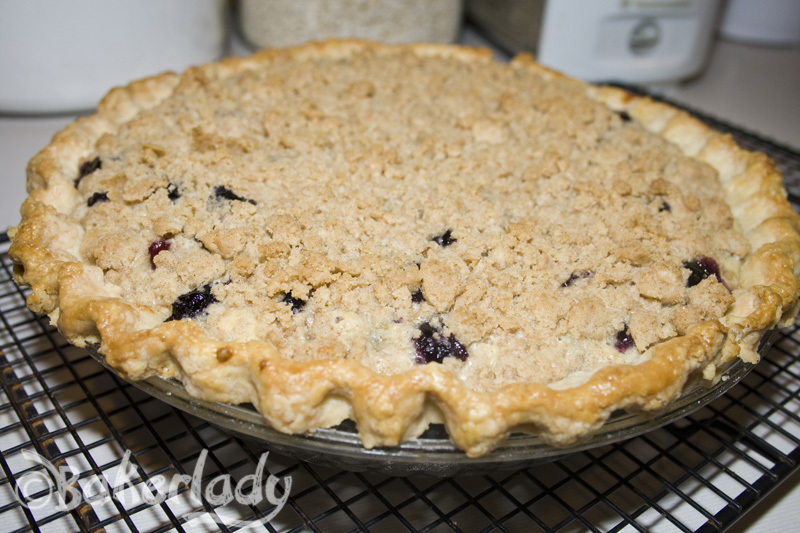 I made this pie and it is absolutely delicious! Shared it with my friend whose husband thinks he is the only person who can cook well and he loved it to!!! Keeper recipe!! Isn’t it fun when you can show off to someone? Love it! Glad you enjoyed the pie! Oh yum, your pie looks and sounds absolutely delicious! 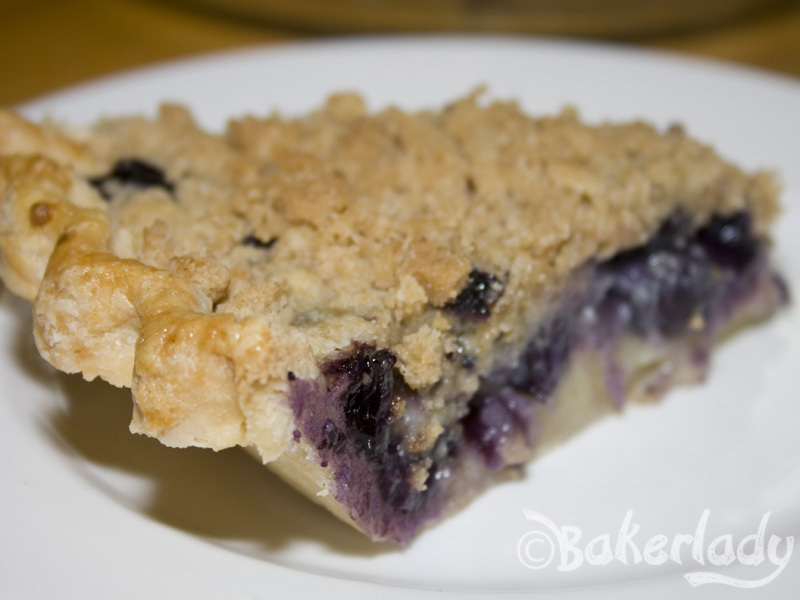 Picked up some gorgeous blueberries today – this is still my all time favorite blueberry dessert!